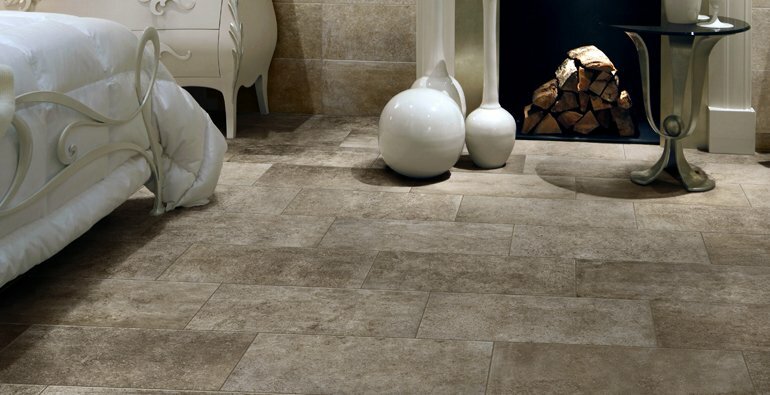 Caring for porcelain tile quite simple and is one of the many benefits of this material! Sweeping it often is an important part of maintenance. Over time dirt can start to stick to the surface of the tile. Place mats outside and inside at each point of entry. This is a great way to collect dirt that would otherwise be tracked onto the tile. We strongly recommend doing this to further protect floors from dirt. Select a mat that will collect the dirt that is knocked off shoes and boots. Feel free to use a vacuum and the attachments to remove dirt from tiles, corners and in between tiles, but make sure to turn off the rotating brush first. This brush can dull the surface. The best way to care for porcelain tile is to sweep it regularly. After sweeping, use a damp mop to clean the remaining dirt off the tile. Use only grout and tile cleaners recommended by the manufacturer. Make sure to rinse the tile thoroughly after using a cleaning product, since detergents can leave residue that attracts dirt which could stick to the surface. Spot cleaning is a perfect way to clean spills or between deeper cleaning sessions. Make sure to rinse the cleaner off and dry the tile with a clean dry towel. Wiping with a dry towel will result in more shine. Avoid using any abrasive sponges or steel wool. These products can scratch the surface of the tile. Never use bleach or ammonia on this type of floor. Products such as these can cause discoloration of the grout and tile over time. When moving furniture, do not drag it across the floor. Pick the furniture up and move it. If furniture is too heavy to pick up, place furniture moving pads under the feet of the piece and carefully slide it across the floor. After new tile has been installed, it is a good idea to seal it. This will keep the floor looking new and clean for a longer period of time. It will also protect the tile and grout from water that spills onto the floor. Sealing is a good idea for bathrooms, kitchens and mudrooms. Always follow manufacturer recommendations. Providing proper maintenance will keep floors looking great for many years to come.